Mozu Katchan's win in the 1m3f Queen Elizabeth II Cup at Kyoto on Sunday meant she became her sire Harbinger's second elite winner in as many months. 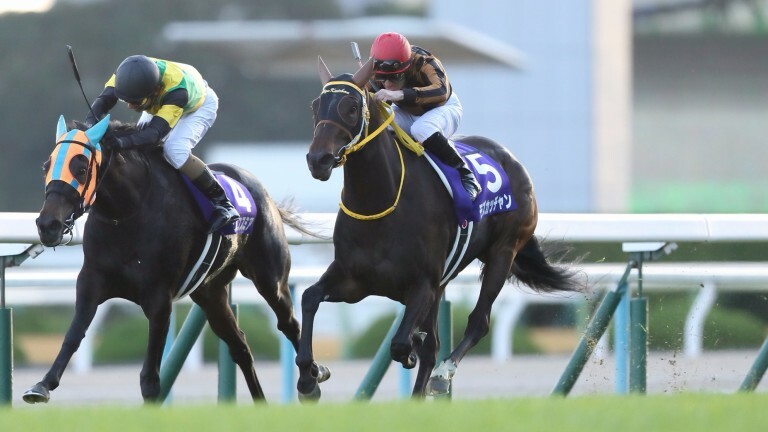 Trained by Ippo Sameshima and ridden by Mirco Demuro, the three-year-old filly charged down the leader, the four-year-old Stay Gold filly Crocosmia, inside the last furlong, holding off the fast-finishing Deep Impact mare Mikki Queen into third. Bred by Northern Farm, Mozu Katchan is by the 2010 world champion out of the King Kamehameha mare Site Dealer. There is a European flavour to Mozu Katchan's pedigree on her distaff side as well, as her granddam Best Boot is a half-sister to Poet's Voice - winner of the Queen Elizabeth II Stakes at Ascot the same year Harbinger demolished the field in the King George VI and Queen Elizabeth Stakes at the same course. Harbinger's first top-flight winner came when Deirdre won the Shuka Sho - or final leg of the Japanese Fillies' Crown - in mid-October. The son of Dansili has stood the past seven seasons at Shadai Stallion Station at a private fee.